Probably the most dramatic run in the Sarasota area is over the Ringling Bridge, which extends past the Sarasota Bay, from Sarasota to St. Armand’s Key and Lido Key. 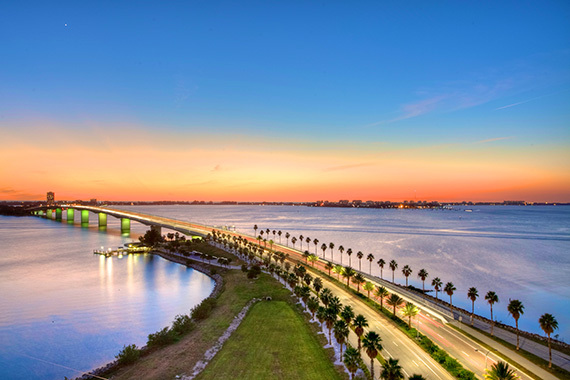 Named for John Ringling, best known as one of the founders of the Ringling Bros. and Barnum & Bailey Circus, who was once a resident of the Sarasota area, it is the third bridge on this site. We’ve mapped 7.2 miles from Marina Plaza to Longboat Key, including a ~1 mile loop to Bayfront Park. The main bridge run starts at Marina Plaza, and is 2 miles to St. Armands, including a little jaunt out to Golden Gate Point. There are great views of the bay and surrounding waters from the wide path separated from the road. There are also some opportunities for some firm sand beach running here: 1 mile on Lido Key, and several miles on Longboat Key. Add-Ons: 1 mile to end of South Lido County Park from St. Armands Circle—can be on the beach here in the right conditions. There’s also a nice 1 mile jaunt from Marina Plaza to Bayfront Park, or 2 miles to the Botanical Gardens, along a pretty waterfront path.